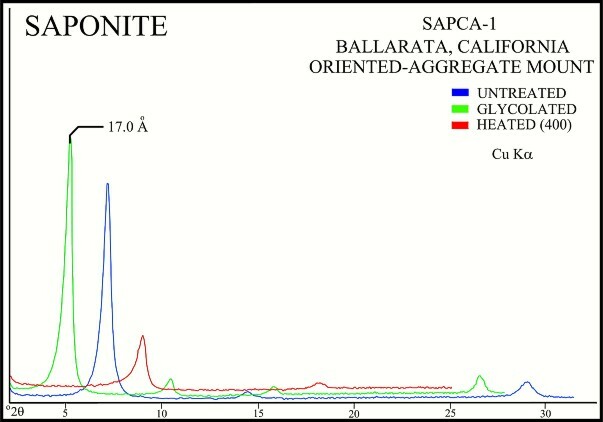 Members of the smectite group include the dioctahedral minerals montmorillonite, beidellite, and nontronite, and the trioctahedral minerals hectorite (Li-rich), saponite (Mg-rich), and sauconite (Zn-rich). The basic structural unit is a layer consisting of two inward-pointing tetrahedral sheets with a central alumina octahedral sheet. The layers are continuous in the a and b directions, but the bonds between layers are weak and have excellent cleavage, allowing water and other molecules to enter between the layers causing expansion in the c direction (Grim, 1962). 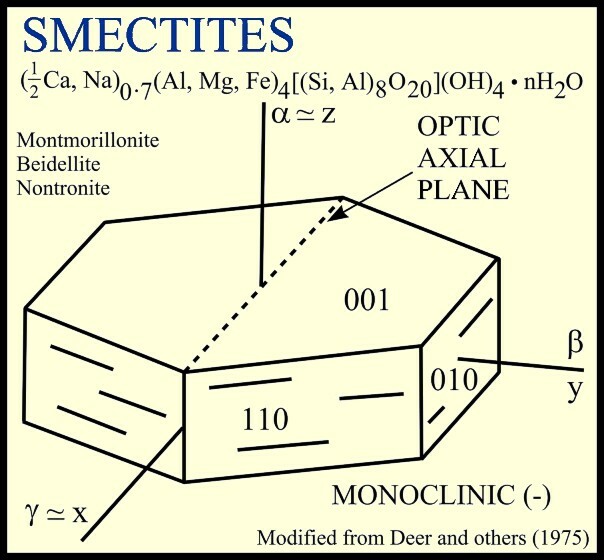 Smectites commonly result from the weathering of basic rocks. 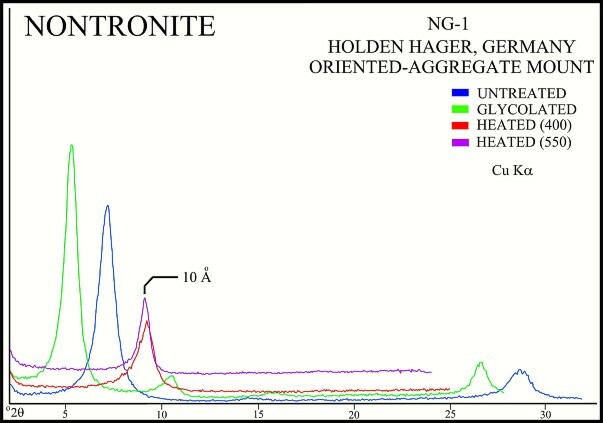 Smectite formation is favored by level to gently sloping terranes that are poorly drained, mildly alkaline (such as in marine environments), and have the high Si and Mg potentials (Borchardt, 1977). Other factors that favor the formation of smectites include the availability of Ca and the paucity of K (Deer and others, 1975). Poor drainage is necessary because otherwise water can leach away ions (e.g. Mg) freed in the alteration reactions. Smectites are used in industry as fillers, carriers, absorbents, and a component in drilling fluids (Grim, 1962). Smectites yield X-ray diffraction patterns characterized by basal reflections that vary with humidity, exposure to certain organic molecules, heat treatment, and exchangeable cations (Wilson, 1987). 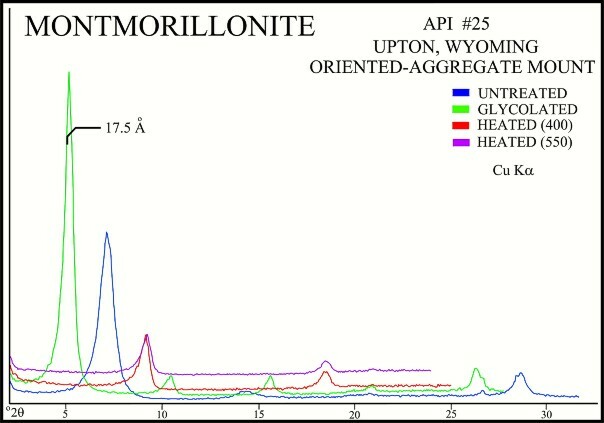 When saturated with ethylene glycol, the 001 reflection of most smectites will swell to about 17 angstroms (about 17.8 angstroms with glycerol); when heated to 400 C, the 001 reflection will collapse to about 10 angstroms (the exact amount of collapse is often related to the exchange cations present and to the smectite itself). 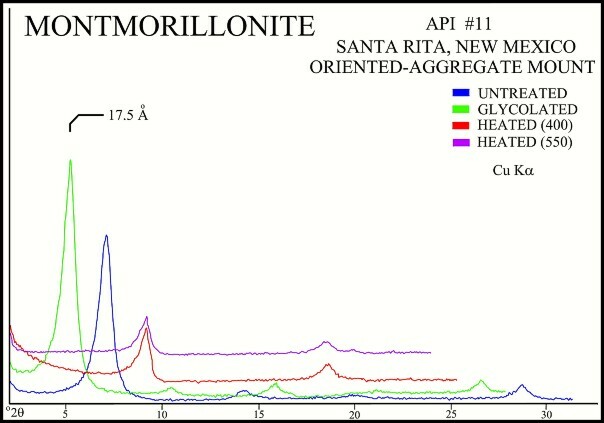 Individual smectites can sometimes be differentiated by their higher-order peaks or by cation saturation. 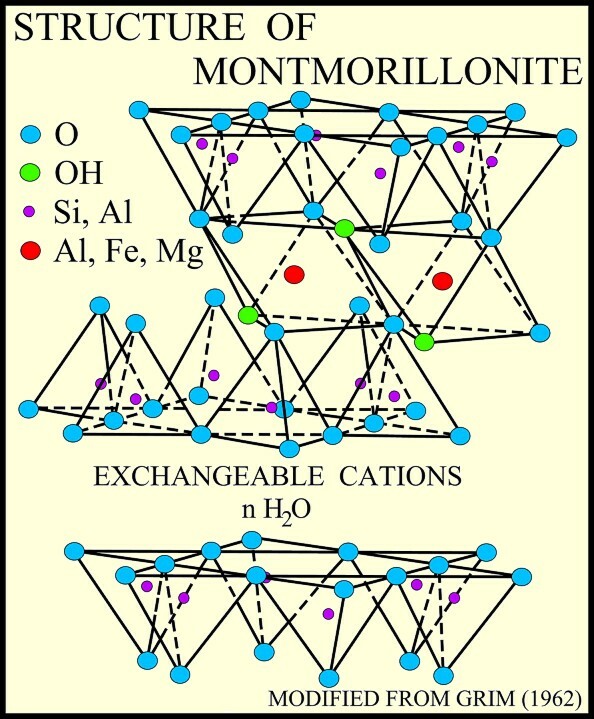 For example, dioctahedral smectites have 060 reflections at 1.50-1.52 angstroms, whereas trioctahedral smectites have 060 reflections at 1.53-1.54 angstroms; and Li saturation can be used to differentiate some montmorillonites from beidellite (Schultz, 1969).